flowers that were presented by Layton Hodgetts. 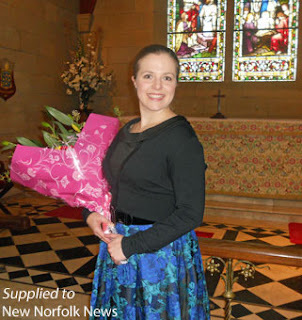 THERE were tears among some of the audience members as home-grown soprano Bryony Dwyer sang Home Sweet Home (there's no place like home) as an encore at her concert at St Matthew's Church in New Norfolk on Sunday afternoon. "It was a great concert - she did it all beautifully," family friend Ngaire Glover told the New Norfolk News. Home from Switzerland for a short holiday, Dwyer offered to give a recital in aid of victims of the recent floods. "The Derwent Valley has been hit hard by the recent crazy weather and I'd love to fill our lovely church and get some relief funds together to help those in need," she wrote on Facebook prior to the concert. Entry was by donation and the event raised $1100. In the audience were a number of familiar faces including ABC-TV newsreader Peter Gee and the Federal Member for Lyons presumptive, Brian Mitchell. Mr Mitchell later described the concert as "gorgeous, funny, laid back and world class." Also in the audience were many of Dwyer's family and friends, including her grandfather Russell Dwyer who travelled from New South Wales. The recital was followed by afternoon tea in the church hall where the fare included a cinnamon tea cake baked by Dwyer that morning using her mother Terry's cookbook. Born in NSW and raised in the Derwent Valley, Dwyer attended New Norfolk High School and later studied opera at the Sydney Conservatorium of Music. She played clarinet with the Derwent Valley Concert Band and later joined the Royal Australian Navy Band. Following her studies Dwyer was named the 2012 recipient of the Vienna State Opera Award and after completing a four-month placement in Austria she stayed on for the 2013/14 season. Dwyer is presently based in Basel, Switzerland, as a member of the Opera Studio at Theater Basel. Congratulations on your magnificent career Bryony, and welcome home.